Canine folliculitis is a bacterial infection of the hair follicles. 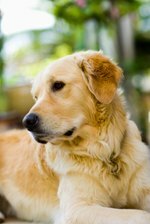 Suspect folliculitis if you notice your dog itching or scratching more than usual or shedding lots of hair. It is important to be aware that folliculitis is nearly always a secondary infection arising from a different disease or condition. It will keep recurring unless the underlying problem is sorted out. You can treat the symptoms at home, but for a lasting cure, you must ask your vet to diagnose and treat the primary condition. You may feel lumps or pimples under your dog's coat or notice raised tufts or reddish stains. Look for inflamed pustules in the skin, with crusty scales that fall off to leave collar-like rings around the lesions. They can occur anywhere on the body, but most commonly over the back, neck, groin and armpits. If the infection gets into deeper layers of skin, the dog may show signs of pain and general illness as well as itchiness and hair loss. Folliculitis is a staphylococcal bacterial infection. It can set in alongside skin problems such as mange, scabies or seborrhea, and can be spread by fleas, lice or other parasites. Infections can take hold easily if the dog has problems with hormones, allergies or immune deficiency or suffers skin injuries. Other names for folliculitis include recurrent pyoderma, pruritic pyoderma, staphylococcal allergy and bacterial hypersensitivity. Before starting treatment, get rid of fleas and other parasites using powder or spot-on medication. Clip long-haired dogs to expose the affected areas of skin. Bathe the dog twice a day with shampoo that contains povidone-iodine or chlorhexidine, according to WebMD, which adds that after 10 days, switch to bathing once or twice a week with a benzoyl peroxide shampoo. If the infection has penetrated below the epidermis (skin surface), you also need to dose the dog orally with antibiotics or apply antibiotic cream, or both, for up to eight weeks. Follow the vet's instructions. Dietary supplements that are good for general skin health include sunflower, safflower, primrose and fish oils. If you think an allergy may be causing problems, try feeding a hypoallergenic diet for 10 weeks. Use flea powder or spot-on lotion regularly to prevent flea infestation. Oatmeal shampoo or flaxseed oil helps to moisturize the skin while bathing. For mange, mix lime sulphur dip with shampoo. Avoid making healthy skin dry and flaky by washing it too often, and avoid damaging it through brushing too vigorously.